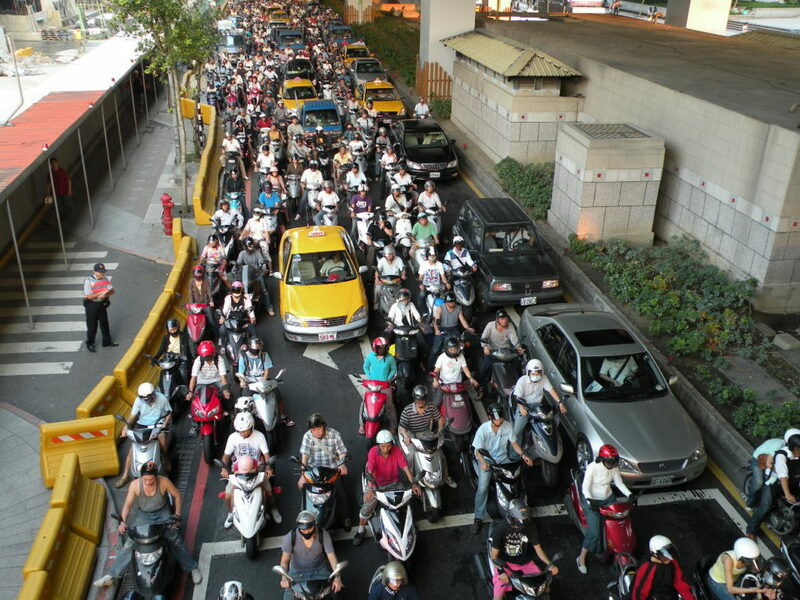 Taipei, Taiwan had 13.4 million registered motorcycles in 2010. Jason Chang is a professor of civil engineering at the National Taiwan University who together with his colleagues in NTU, has played in an important role in developing motorcycle management policies in Taiwan. As part of a new exploratory project with EMBARQ India on motorized two-wheelers (M2W), Rebecca Heywood recently spoke with Professor Chang about the role of motorcycles in Taiwan and the lessons developing countries like India can learn from the experiences in Taiwan. For some background, Taipei, Taiwan is home to the highest motorcycle density in the world, with 13.4 million registered motorcycles and 6.7 million registered cars in 2010, a density of 870 motorized vehicles per 1000 population and 560 motorized vehicles per square kilometer. What was the catalyst for increased attention to motorcycles and their role in urban transport? The need for motorcycle management in Taiwan was first voiced by academics. Through articles in local papers, reports, consumer foundations and public hearings, we eventually got the support of the mayor, who began working on motorcycle policies. On a national level, about 30 years ago the then-Prime Minister asked the Minister of Transport about motorcycles, which were quickly rising in popularity. The Minister of Transport responded that motorcycles would disappear with higher income levels, but this has not been the case. About 80% of Taiwanese families own both a car and a motorcycle, and when there was an increase in oil prices about 3.5 years ago, about 20% of car users shifted mode, about 5% to public transportation and 15% to motorcycles. How has the view of public transportation in Taiwan changed over time? What about cars and motorbikes? Despite having one of the most comprehensive public transport systems in Asia, people in Taipei continue to use private automobiles (cars and motorbikes) because the costs continue to be comparatively low. Private vehicles are convenient and there are often no parking fees for motorcycles. Until 15 years ago, motorcycles were allowed to park just about anywhere, including sidewalks. Until users are charged the full cost of these modes, it will continue to be an uphill battle to get people to switch to public transportation. Public transportation currently has a 35% mode share in the Taipei Metropolitan Area, but the goal is to increase this to 60%. Currently motorbikes are thought of as the most convenient mode of transportation, due in large part to their low cost of use, but as the users begin to pay the full cost of use and the subway and BRT networks continue to be improved, more people are expected to begin riding public transportation. Car parking continues to be more difficult to find and more expensive than motorbike parking, and we believe this plays a large role in the high mode share of motorbikes in Taipei. Even though many families own both, M2Ws are used for daily and commuting trips, while cars tend to be used for occasional trips. What do you consider the full social cost of using motorbikes? Motorcyclists in Taiwan pay only 40% of what they should. They generate numerous external costs, including pollution, noise, fatalities and congestion that affect everyone in their environment, not just the users. They are allocated enormous amounts of public space for parking, which takes space away from pedestrians. This is not just an issue for M2W, however. It also applies to car users, another demographic that needs to be responsible for their own costs and their effect on society. One strategy to improve motorbike parking in Taipei was to implement motorbike parking fees on a zone-by-zone basis in order to acclimatize users to paying parking fees. We are now at about 60% implementation of motorcycle management, and the reaction has been positive. Motorbikes no longer park on the side walk because some curbside parking has shifted from cars to motorbikes. More motorbike users are paying parking fees despite an initial reluctance, and pedestrians are now more comfortable and pedestrian flow has improved within the city. Although there was initial reluctance from motorcyclists about losing curb parking and free parking, they eventually acquiesced. What type of policies has Taiwan set-up for two-wheelers and how have these affected their use? Taipei began implementing motorcycle specific traffic management policies as far back as 1984. It began with setting up a two-stage left turn regulation. Motorcycles are not allowed to make direct left turn and instead we have built double left turns at major intersections. Left-turning motorbikes need to travel straight across an intersection to a painted motorcycle box and wait for the next traffic signal to turn green. Additionally, two-wheelers have a specific waiting zone in front of cars because they have faster accelerations from stopped. Finally, there are some separated motorcycle lanes on major roads, and two-wheelers are not allowed in certain lanes as well. For safety reasons, two-wheelers are not allowed to drive on expressways in Taiwan, and are considered a form of urban transport. Are motorcycles the future of transportation in Taiwan? Public transportation currently has a 35% mode share, but the goal is to increase this to 60% in Taipei Metropolitan, though most other Taiwanese cities have public transport mode shares below 10%. Currently motorbikes are thought of as the most convenient mode of transportation, due in large part to their low cost of use, but as the users begin to pay the full cost of use, we expect more people to begin riding public transportation in the Taipei Metropolitan Area. For other cities, we expect that motorbikes will be integrated with public transport and electric motorbikes will be introduced as low carbon city demonstration projects. In terms of the environment and the overall social good, public transportation needs to be at the forefront of transportation in Taiwan. While two-wheelers are more agreeable than cars, a high mode share for any type of private motorized transport is not what we envision for Taipei. In other Taiwanese cities, however, we are looking at electric motorbikes as a low-carbon alternative to conventional motorbikes. It is not realistic to expect quality public transportation overnight across Taiwan, and we must consider other options. Why is it important to consider motorcycles when thinking about urban transport? It is important to think about motorcycles as a normal mode of transport, not lumped together with cars or with non-motorized modes, such as cycling and walking. They have unique characteristics and fill a void in the transportation spectrum. They have a smaller footprint than cars, both physically and environmentally, particularly when they are electric powered. But this does not mean they don’t need to be regulated. Economics play a big role in why people use motorbikes, and most owners of motorcycles are not poor, contrary to popular belief. Motorcycle users are not necessarily vulnerable users (i.e. low income), but this is the common perception of two-wheeler users. When the full cost of using a motorcycle is not levied entirely on the user, it makes it a cost-effective form of transportation for individuals. This knowledge allows for greater flexibility in managing motorcycles and allows the full cost of use to be levied on users. While this may not be in the case in all developing cities, it has impacted motorcycle management policies significantly in Taiwan. Out of the Driver's Seat: Are India's Auto-Rickshaws Safe for Pedestrians and Cyclists?